Map of the Southern States except Texas. 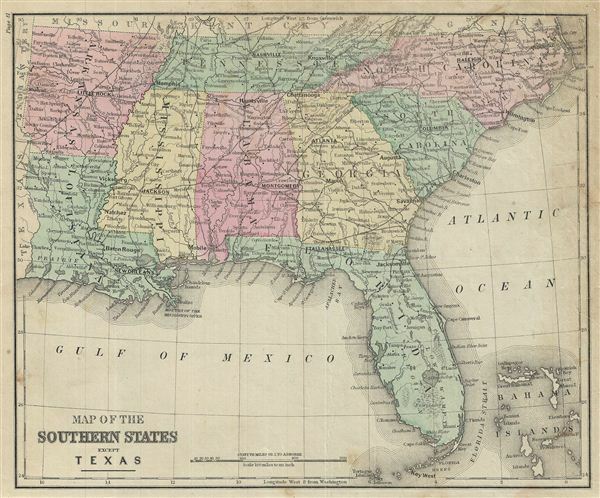 This is an example of David M. Warren's 1879 map of the Southern states of the United States. It covers Arkansas, Louisiana, Mississippi, Tennessee, North Carolina, South Carolina, Georgia, Alabama and Florida, including the Bahamas. The mouth of the Mississippi is identified. Throughout, the map identifies various railroads, cities, towns, rivers, swamps, islands, mountain passes and an assortment of additional topographical details. The map is color coded according to regional and political boundaries with elevation rendered by hachure. Issued as page 41 in the 1879 edition of Warren's Common-School Geography.